As mentioned in my ultimate gearing article, the main disadvantage of having 20-inch wheels is that your top-speed gearing may be lower than ideal. The main issue is that the stock gearing hardware used was originally designed for larger 26" or 27" wheels. A stock 9-speed cassette has sprockets from 32T to 11T (teeth per sprocket). The 11T sprocket is your high gear and determines your top gear ratio. To increase to top-end gearing on small-wheel recumbents, Shimano introduced a special cassette and wheel hub that includes a 10T and 9T sprocket. This has the effect of raising the top-end gearing back to where it should be. Because the 10T and 9T sprockets are so much smaller, they will not fit on a standard wheel hub. To use the Capreo system you have to use the Capreo Hub and Capreo cassette together. Sounds great, yes, but for some reason Shimano has made these hubs and cassettes relatively hard to find in the USA. We finally found a source, but have to import them from Europe. Once we get the hubs we have to make a wheel for them. The great part is that once you have the wheel, all you have to do is put it on your trike to take advantage of the higher gears. It also means you can swap your wheels back if you ever want to. Most people will probably be content with the stock Capreo cassette of 26T-9T. If you're not, you can create your own gears by grinding off the rivets on the back of the cassette. I did this because the 26T wasn't low enough for me (I only run 53T/56T chainrings in front), so I put a 34T sprocket on the cassette and removed the 23T sprocket. Since I normally ride in the 11T sprocket with the stock cassette, I really wanted to see what kind of a difference 1 or 2 teeth on the sprocket could make. The difference of these sprockets is about 10%, so the ratios are pretty close. Using the Capreo quite regularly for a while now, I find that my average speed on a 20+ mile ride is about 2-3mph faster with the Capreo. On several downhill runs, the Capreo makes the difference between spinning out at 27mph and pedaling up to about 36mph. 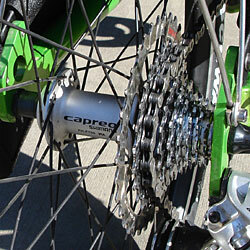 If you have a 9-Speed derailleur and shifter the Capreo wheel will work without having to make any adjustments. The 9T sprocket is pretty small and when it is engaged there are only about 3-4 teeth with chain on them. So far, I have only had the chain slip when I was on the 9T sprocket a couple times. If you are going from a 32-11T wheel to a 26-9T Capreo you could remove a couple links of chain, but you might as well leave it alone in case you ever want your old wheel back on. If you have already reached your speed limit with the stock gearing on your trike, you may be looking for a way to increase your gear ratios. I think the Capreo is a really great solution if you already have a 9-speed derailleur. Unlike the Schlumpf drives, you can easily install this upgrade yourself without making any major modifications to your trike. Another plus is that you can keep your wheel if you ever upgrade your trike to a different model. If you want an even higher top end you can still combine the Capreo with a 56T chainring, or the Schlumpf High Speed Drive.